In August 2015, we successfully applied for a public art grant to set up a project that would bring people in Trumpington together at a time when the village was experiencing tremendous changes as a result of the new developments on the southern fringe of Cambridge. 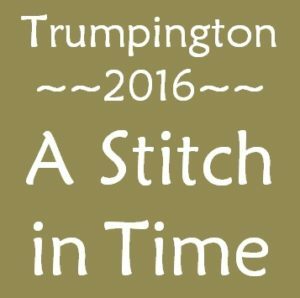 The idea was to make a piece of textile art capturing views of Trumpington that mattered to the people taking part. We hoped that along the way we would all learn new skills, meet new people and enjoy creating something unique that would go on display in one of our new community buildings. The grant was spent on setting up this website, holding workshops, buying materials and engaging the services of local textile artists as tutors and advisors. It has been a great success, and no less than four quilted wall hangings have been completed on time. The two large ones, Quilt A and Quilt B each have 12 panels made by individuals. These will be on display in the Clay Farm Centre. Two smaller ones were created by two local church groups from the local parish church of St Mary and St Michael and the new congregation of Christchurch Trumpington These are on display in the two churches.